Organize your game room accessories and clear up floor space with the Heritage Wall Rack. 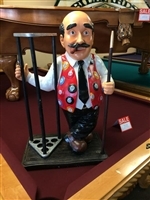 Designed to completely meet your billiard storage needs, the rack provides space for cues, two ball racks, brushes and additional pool accessories. Available in Port, Onyx, Traditional Oak and Black Cherry, the Heritage Wall Rack easily fits into any game room setting. A hardwood wall rack for storing your cues and triangle and diamond racks. 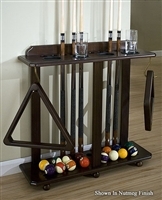 Safely and neatly store 10 cues, ball rack, balls and additional accessories in this convenient corner rack from Heritage. Recessed cups on top serve as beverage holders or as chalk cups, your choice. Available in Port, Onyx, Traditional Oak, Black Cherry, and Nutmeg finishes. Our Classic Wall Rack offers traditional styling for any decor and holds 8 cues, 2 ball racks, chalk, table brushes and any other "necessities" you may need. With solid Legacy craftsmanship and easy wall mounting, our Classic wall rack is a great way to dress up that empty wall in the game room.